We just got back from visiting our daughter in Washington, D.C. – after visiting my brother in Colorado Springs. It’s been a busy month for both my husband and me! This year I decided that rather than stand in the kitchen all day long cooking, I would treat myself to a day of heating prepared casseroles that I bought at various stores. Our son will be coming over for the meal, so I’ll be able to visit with him – instead of rushing around in the kitchen. Ya-hoo! I hope all of you are able to enjoy this day of giving thanks. I am glad you could visit family. Have a great day! Sounds like a great idea. I think it is more important to spend time with family than spend all day cooking. Happy Thanksgiving to you and yours…I know I am not alone in being thankful for your tremendous support of our community! Danna, just think of the prepared sides as from old family recipes , just not yours! Have a really nice day and visit with your son. 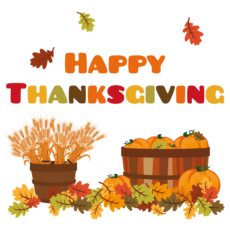 Happy Thanksgiving to you and your family – and to all the readers of this great blog. I decided to buy a frozen apple pie this year instead of baking one from scratch. We are also just having a turkey breast instead of the whole bird. I remember my grandma getting up in the middle of the night to bake and baste the turkey. I am so thankful those days are now just memories. Thanksgiving is really about spending time with family and friends. Happy Thanksgiving! Happy Thanksgiving to you & your family.Enjoy your day! What a marvelous idea! Wish I’d ever thought of doing this but will definitely keep it in mind for future gatherings! Thanksgiving blessings to you and yours! Enjoy your dinner with your family. Too often we make the day about producing some spectacular meal and forget what we should all be most thankful for, those we love and who love us in return. We have decided that dining out is the way to go this year as no one really has the time or energy to cook for at least eight people. My husband and I just drove a truck from Baltimore to Arizona. It is the first of what may be several pre-retirement trips. This one was primarily books, bookcases and collectibles. Sadly, we filled a 26 foot truck, but it doesn’t look like we took much out of the house. I have said a number of times, we have too much stuff, but neither of us wants to get rid if certain things, like books. Happy Thanksgiving. I truly enjoy your blog. Happy Thanksgiving, Danna, and to everyone! It sounds like you have a nice day planned. Your casseroles sound like a great idea. I ordered Thanksgiving dinner from a local market, and picked it up yesterday. All we have to do is heat and serve, although some of the items go into the oven to reheat. Glad you got to see your daughter and brother. Happy Thanksgiving to you and your family and regarding your plan — it sounds like a good one! Quite frankly, it is something that we’ve done quite often in recent years; it frees everyone up to enjoy each other’s company! Susan, that’s definitely true enough! I hope you had a happy Thanksgiving (and a good November as well)!